The Imak's SmartGlove helps prevent and relieve wrist pain, including Carpal Tunnel Syndrome. The Smart Glove encourages your hand and wrist to remain in a neutral position while you work. It features flexible support for full use of the hand and breathable Cotton Lycra for all day comfort. The ergoBeads pad, located on the underside of the wrist, cushions and protects the wrist. Ian MacMorran, M.D., an orthopedic and hand surgeon, developed the patented Smart Glove for his patients. Delighted Customers tell us every day how much the Smart Glove is helping them in providing carpal tunnel relief as well as in the prevention of repetitive stress injury. Use the Smart Glove for prevention of repetitive stress injury and carpal tunnel syndrome, treatment of carpal tunnel syndrome, arthritis, tendonitis, and other wrist pain. 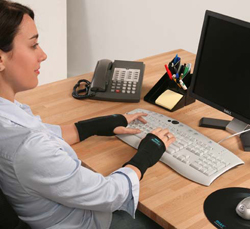 The Smart Glove wrist support is also much appreciated by pregnant women suffering from pregnancy-related carpal tunnel syndrome. Comfortable. Easy Storage. Lightweight. Not Ugly. Not Effective. Flimsy. Expensive. Weak. Perishable. Its not bad, but not for long term relief of repetitive motion stress/injury. Would be a perfectly fine product for temporary use. Relieves Pain. Positions Hands Properly. Comfortable. 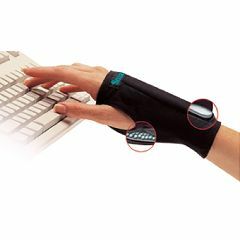 Since developing carpal tunnel symptoms, I have worn these at work every day and they have made a difference for good. I have less pain and less numbness and tingling. This product is too soft and does not hold your wrist in place. I've used the Smartglove since getting tendonitis from mousing/typing about 3 yrs ago. I've finally replaced my original with a new Smartglove, so they definitely last a long time. I wouldn't be able to type/mouse without this glove. I wear it during the day and while at work. It fits ok, but I feel like it should have a little bit more of a snug feel to it. Over all a good product for daytime use.